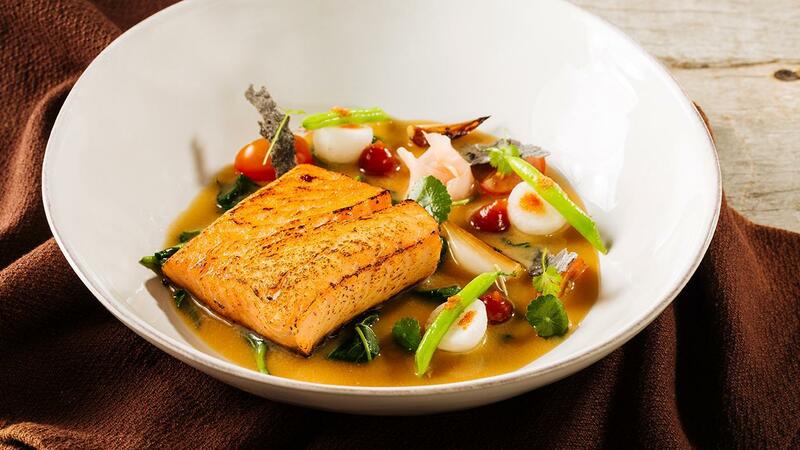 Entice your diners’ palates with a party of flavours in this dish — the richness of salmon and the contrasting sourness and textures of the broth and meats will truly be a memorable gastronomic experience. Clean the salmon belly, making sure its fins and scales are removed. Heat the pan with oil and sear the seasoned belly skin-down until crisp. In a dry bowl, mix the brown sugar, Knorr Napoli Tomato Sauce Mix, and bread crumbs (Aburi mixture). Top the cooked salmon with the Aburi mixture then torch to finish. Pound the ginger, turmeric, onions, garlic, lemongrass, and chili with a mortar and pestle to form a paste. In a pot, saute the paste until fragrant. Add the Knorr Tamarind Soup Base. Strain into a bowl forming a clear broth. In a bowl, arrange the blanched kangkong onto the middle of a serving bowl. Gently position the torched salmon belly on the kangkong. Arrange the rest of the blanced vegetables around the salmon. Transfer the broth into a teapot then pour the soup onto the salmon belly, tableside.